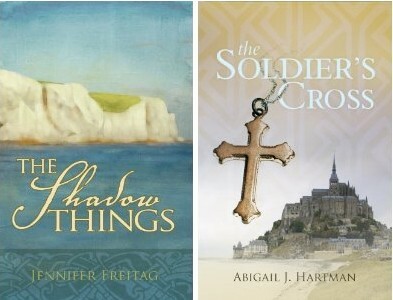 Tessa on her blog Christ Is Write interviewed my sister Abigail and I about our recent published works "The Shadow Things" and "The Soldier's Cross," and about what it is like to be a young writer and author. Check it out! Here's a sneak-peek. What sort of challenges have you faced from dealing with your career as an author and being a student as well? Being homeschooled has been a very helpful in affording time for me to write during the day, and my mother is very flexible; I am able to arrange my schedule and do both schoolwork and writing with relative ease, although during some parts of the semester I have to focus more on reports and exams. Also, now that I am published, my writing counts toward Grammar as a school subject. I completely ignored my schoolwork and drove Mom crazy. Honestly, as soon as I was reasonably done with a subject, I would scamper back to my computer and bang out some more on a story. Or, even worse, I would procrastinate like nobody’s business on my schoolwork in favor of writing on a story. I did, however, manage to graduate with decent grades, and now that I am married I do a manageable job juggling writing and tending the home. So yes, I'm not dead. I'm even contactable. Meanwhiletide I'm working on some character busts for Adamantine, and when I'm done I hope to make a proper post for them here on Penslayer. Stay tuned! Wiglaf's sketch is being a jerk. The things I suffer...!